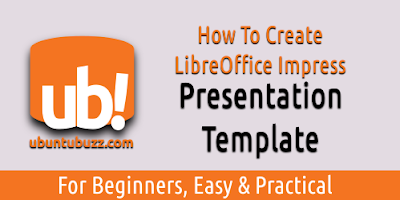 This simple article gives you 7 steps to create your own LibreOffice Impress presentation template. You can create it by using a vector editor (e.g. Inkscape). You will save the template as ODP file. And we add some ready-to-use simple templates download links in the end. We hope this helps you. In Inkscape: create a rectangle with size=4:3. For example, 400x300 px. Give it color you like. 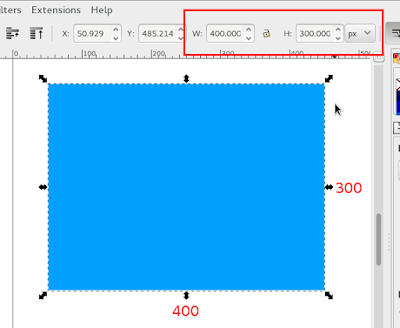 In Inkscape: create header bar and footer bar. 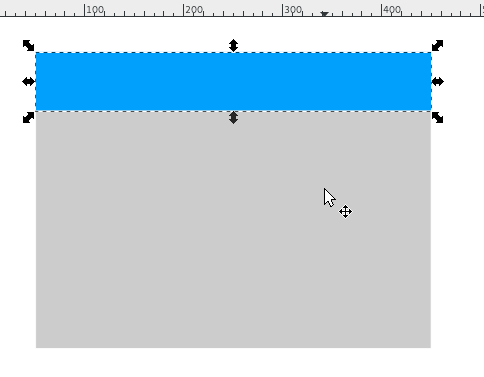 Just duplicate (Ctrl+D) the rectangle and resize it vertically to top. Do the opposite (to bottom) for footer bar. Give them color you like. 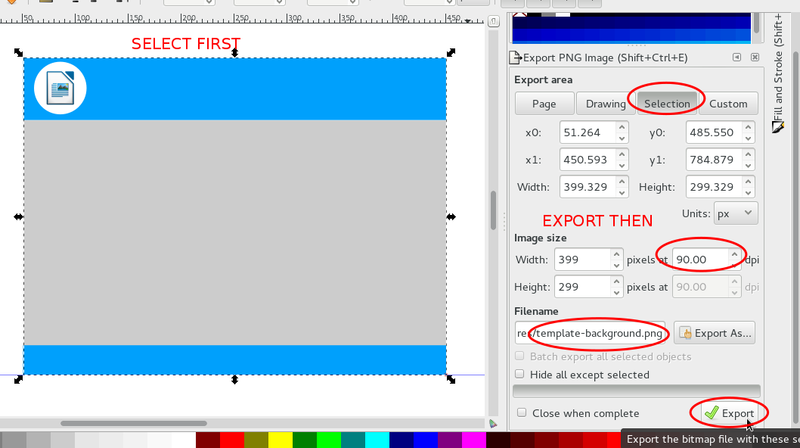 In Inkscape: add image you like. For example, you can add an icon as your company logo. In GNU/Linux, you may choose it from many icon examples in /usr/share/icons/hicolor. 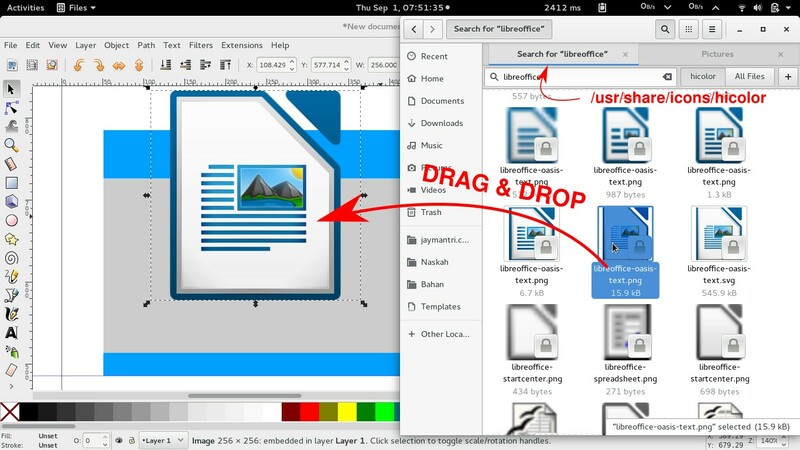 Drag and drop the image from your file manager to Inkscape canvas. Resize it or restyle it to satisfy your need. 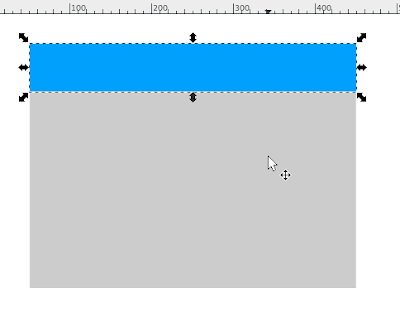 In Inkscape: export the objects. Select all objects first > press Shift+Ctrl+E > activate Selection button > set 90 dpi (or 150 dpi) > set file name > press Export button. See picture below. In Impress: set image to be the presentation background. Right click slide > Set Background Image > choose your image > select Yes. The result is like picture below. 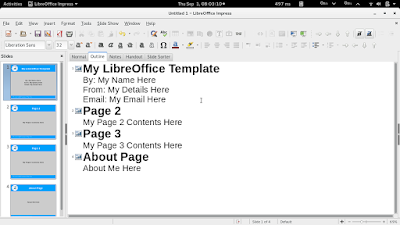 In Impress: edit your presentation document to suit your needs e.g. ready to be a template. 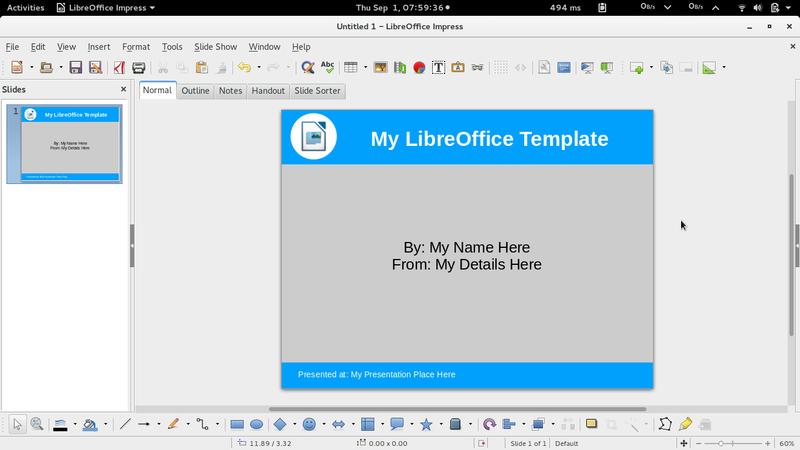 For example, give it title around "Template" or such and give it blanks for presenter name and details. 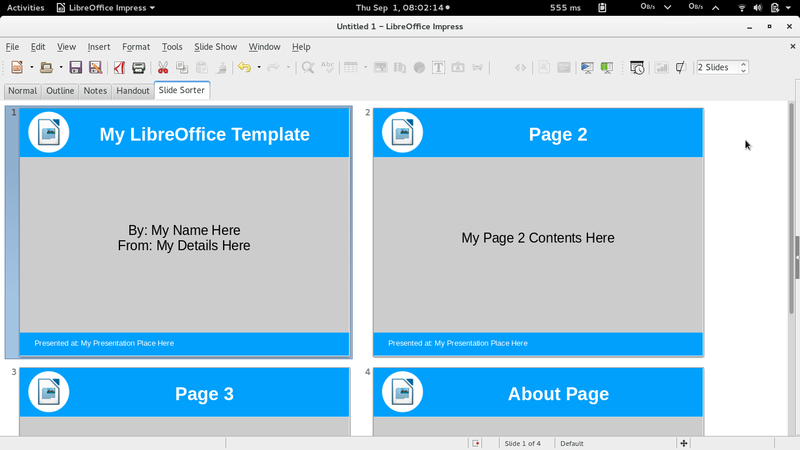 In Impress: create more pages. Do it by right click slide item (left panel) > Duplicate Slide like picture below. Edit every page to suit your needs. 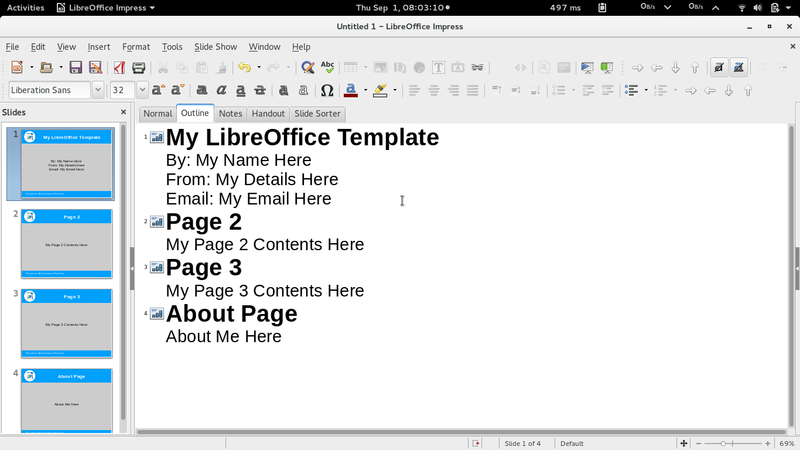 For example, page 2 contains images, page 3 contains tables, adding about page, and so on. 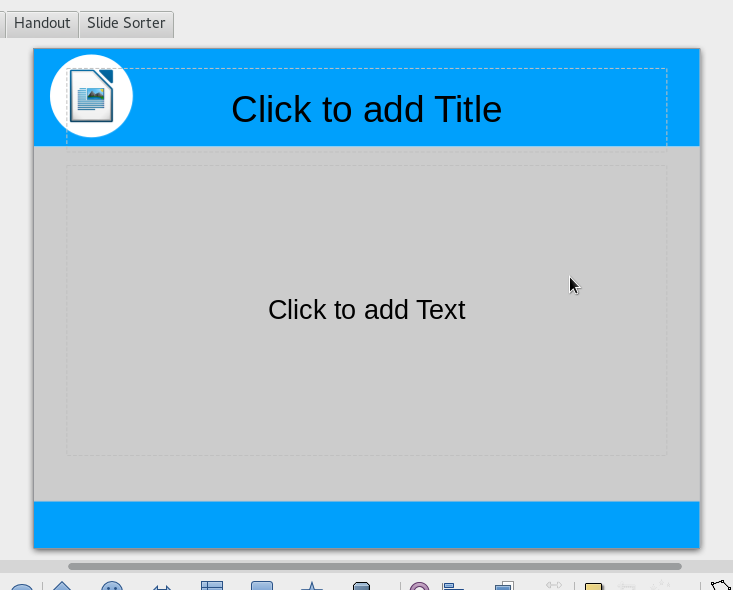 You may open Slide Sorter tab to see the overview of your presentation template. 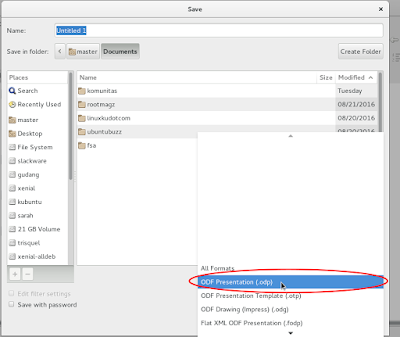 Press Ctrl+S > select format: ODF Presentation (.odp). You may also save it as .otp if you like it. To ease editing, do text editings for all pages from Outline tab. By this, you don't have to visit every slide to edit them one by one. It is very useful especially if you have many slides. 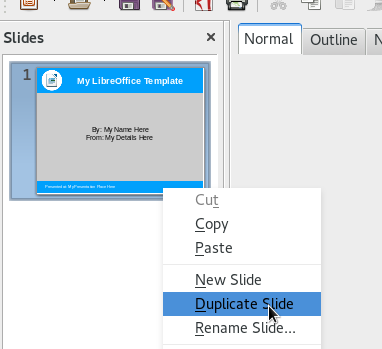 If you want to use different background image for every slide, choose No if LibreOffice asks you whether to set it for all pages or not. See this picture.